Heritage conservation in Australia has traditionally focused on monumental masonry structures and public buildings. Timber heritage conservation has attracted comparatively less attention within the heritage profession. 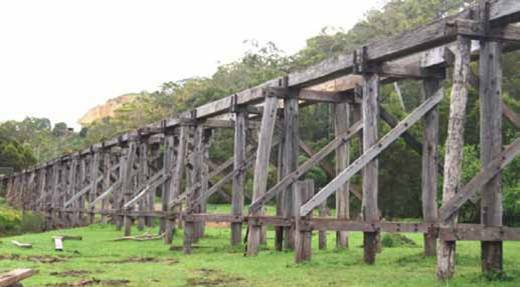 There is a renewed interest in conserving industrial heritage, which features many Australian native timbers and unique construction methods. Preface: The International Wood Committee Charter: Principles for the Preservation of Historic Timber Buildings was adopted by the ICOMOS 12th General Assembly, Mexico, October, 1999. Education and training are essential to a sustainable preservation and development policy. The aim of this document is to define basic and universally applicable principles and practices for the protection and preservation of historic timber structures with due respect to their cultural significance. Historic timber structures refer here to all types of buildings or constructions wholly or partially in timber that have cultural significance or that are parts of a historic area. The 12th ICOMOS General Assembly, Mexico, October, 1999. The objectives of this charter are to promote and manage tourism in ways that respect and enhance the heritage and living cultures of the host communities, and to encourage a dialogue between conservation interests and the tourism industry. It outlines six principles of cultural tourism: conservation should provide well-managed opportunities for tourists and members of the host community to experience and understand the local heritage and culture at first hand; the relationship between heritage places and tourism is dynamic and should be managed in a sustainable way for present and future generations; conservation and tourism planning should create a visitor experience that is enjoyable, respectful, and educational; host communities and indigenous people should be involved in planning for conservation and tourism; tourism and conservation activities should benefit the host community, improving development and encouraging local employment; tourism programs should protect and enhance natural and cultural heritage characteristics.